Ingrid is back in the driving seat! Do you have people with hearing loss working for you? A local employer describes how Workable (NI) has helped one staff member to retain their job! ‘I have been Ingrid’s line manager for a good few years, over this time we had tried a lot of work place adjustments, variations, courses and counselling to help Ingrid and ourselves cope with her disorder and attend work regularly – with little success. 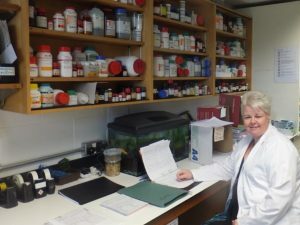 It had actually come to the point where Ingrid’s sickness absence from work had become unsustainable and retirement due to ill health was becoming a real possibility. We had looked before at outside agencies to help stabilise Ingrid’s work pattern but none seemed to be able to help with mental health issues. I was diagnosed with having a Bipolar Disorder and was struggling at work due to several episodes back to back. This lead to the possibility of being retired on ill health. 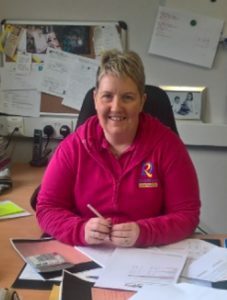 I wasn’t ready to retire so I then turned to Workable NI to see if they could support me and help me stay in work and be an effective team member. I was allocated Robert McGeachy, as my Employment Officer. Alongside both my technical services co-ordinator and my technical service manager who were key supporters within this process I began my programme. Firstly, we looked at my role and put in place some reasonable adjustments. Then I began a course of psychodynamic therapy, through the programme. This was the turning point in the whole process. Now throughout my illness, I’ve received many forms of counselling but this was the most effective I have ever encountered. My counsellor, addressed so many issues that I had never dealt with, it was hard at times but it helped with my ability to manage my illness and gave me a whole new set of coping skills. Both in a work situation and life in general. I really got to know myself. This is turn, showed in my work. I was able to attend on a regular basis. I was able to cope with my duties and was able to even take on more responsibilities, go on training courses without it impacting on my health. All this became very relevant as we came to the twelve-month mark. Now I had been in my role for 17 years. A higher grade role became available within the Faculty, I was fit to apply for this role and was successful in getting the post. Posted on November 9, 2018 at 11:37 am. I wanted to inform SES followers and fellow employers of the Workable (NI) programme that has been supporting Sharon for over a year now. The programme helped my business by offering advice, help, and support to both Sharon and myself. Sharon has worked for me for over 10 years but within the past 3 years she has suffered from depression and anxiety which has led to a struggle in the workplace. She missed days, sometimes weeks at a time and this lead to crucial management deadlines such as VAT returns, wages and revenue submissions not being met. On appointment of Workable (NI) Support Officer, Dorothy Greenaway from AMH in October 2016, Sharon was able to get vital support to help her maintain her position as office manager but on a less stressful and less demanding role. On the advice of Dorothy, Sharon delegated some of her duties to another person, who is employed one day a week on a s/e basis. This freed up Sharon both in her personal health issues and her works role to then be able to attend various private appointments without feeling guilty and knowing that the work was still being carried out. I would recommend this programme to any employers and employees who have currents problems with mental health within their organisation. Posted on February 8, 2018 at 2:49 pm. Our partner, Action on Hearing Loss, has recently finished their latest film all about the Workable (N) programme. This is aimed at assisting employees and employers who either experience hearing loss, or possibly work with a person who has hearing loss. SES can support people to remain in their job where there are issues, resolve problems which are having an effect on attendance or help address capability issues. I think the Academy Award is on its way…. cheers Michael and Holly! Posted on December 14, 2016 at 9:20 am. 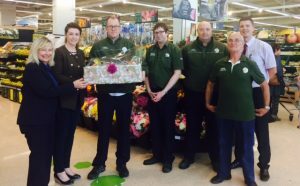 Stuart Gray, the produce team and David Lowry (produce manager) from Tesco’s Bentrim Road branch in Antrim donate a large exotic fruit basket to Celine Hamill of SES. 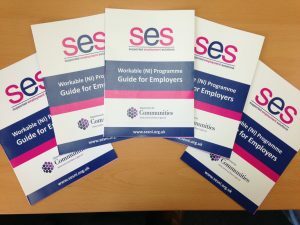 SES have been supporting Stuart and Tesco through the Workable (NI) programme. 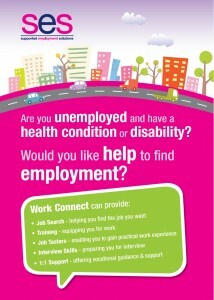 Workable (NI) is a supported employment programme which supports, mentors and trains people to maintain their job. The programme also gives valuable support and advice to employers throughout Northern Ireland. The fruit basket was well received by the staff within the Cedar Foundation and the young people participating on their Summer scheme who all enjoyed their healthy snacks. For more information please take a look at our ‘what we do’ page and please feel free to contact us for a chat. Posted on August 4, 2016 at 9:15 am. After nearly 4 years of operation, the Work Connect programme is coming to an end. SES can still take referrals on this programme until 31 August 2016 to help those with a health condition or disability try and gain employment. To join this voluntary programme please speak to your local Jobs and Benefits office before it is too late. SES cover all disabilities and health conditions in all towns in Northern Ireland. The only eligibility criteria is that you must be receipt of ESA benefit and want a job. Posted on July 25, 2016 at 3:27 pm. Budget Energy, based in Springtown Industrial Estate are working with Supported Employment Solutions to support people into employment. 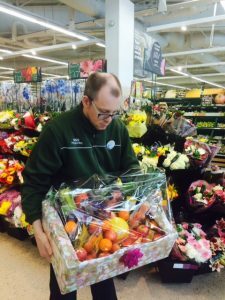 Gavin had started on the Work Connect Programme in December 2015 and due to a health condition he had been unemployed for several years. To help meet the criteria for a position within a call centre, Gavin had to gain relevant recent work experience and Budget Energy allowed Gavin to complete a work placement leading to the offer of a full time job. Gavin has now commenced part time employment with Budget Energy and gets support from his Employment Officer to ensure he achieves his potential. 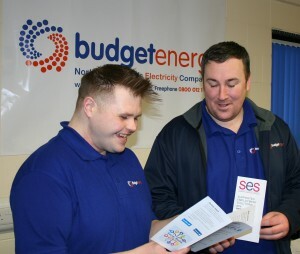 SES have been on hand to support both Budget Energy and Gavin from the beginning of the placement through to employment. Edward Taylor, Customer Services Manager approves; ‘Gavin is enjoying his employment so far and Budget Energy have enjoyed the extra resources and advice from Supported Employment Solutions. As well as checking in with his progress she also asked us what she can do for us and how she can best support us to get the most from this opportunity. If you are an employer and want to know more about our province-wide employment services please contact us. Posted on February 16, 2016 at 10:47 am. I would recommend Work Connect as an employer because it gives the participant the opportunity to learn something new that they may have not tried before and it gives the employer the chance to trial the participant and see their capability’s before hiring. This Programme has given Contemporary Cakes, a small business bakery business in Ballymoney, the chance to work with Elaine and see her develop from a quiet, self-conscious person into the person she is today with her confidence growing with every job she does in the bakery. Through this it has let me see how capable Elaine is and what areas were weak with Elaine and what areas she is strongest in. 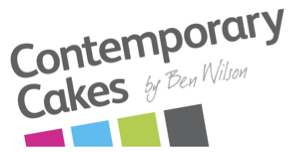 the Work Connect Scheme to other businesses. Posted on February 12, 2015 at 10:16 am. Work Connect was extremely helpful in helping us find someone for a role we needed to fill and in doing so bring someone back to work, they found someone who was well suited to the role and took care of all the details. 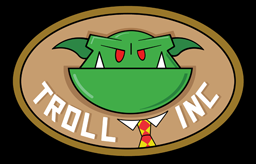 We’re really happy with the person who has filled the role and are really grateful of Work Connect and all the help they have been. I would recommend the programme to any employers thinking of bringing someone on. Posted on August 22, 2014 at 10:57 am.